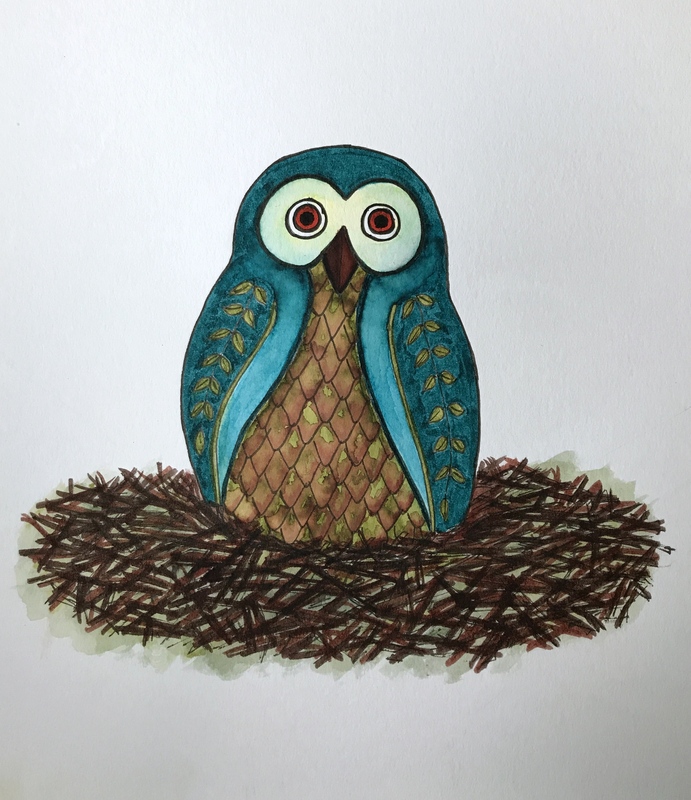 So today sees the first of the new monthly theme challenges we are running over at Art Elements and this month Cathy chose nests as our inspiration theme. Back when she announced this I had a million and one things in my head that I wanted to do but for some reason none of those came to fruition…funny how creativity works. 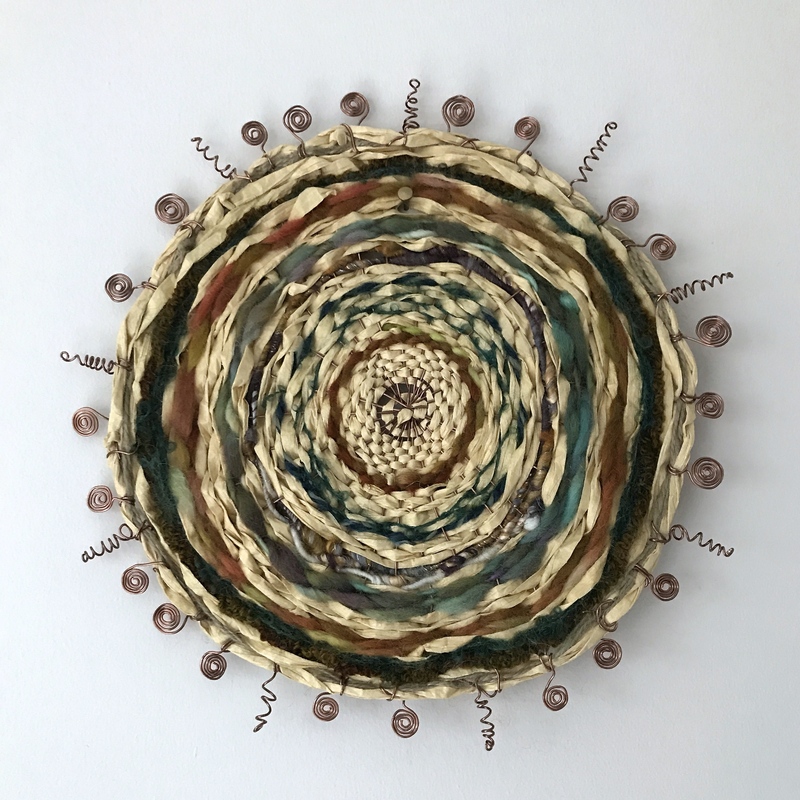 The first idea that came into my head was for an abstraction of the theme involving a circular woven piece embellished with feathers and dried botanical matter that would represent the material and method of nest building without being too literal. I did do the woven piece using wire as the warp thread but when It was completed I realised it wasn’t right. Although I liked it as a woven piece it was too heavy and bulky to work with the other lighter material and should have been a much looser and airier base. I was planning to have another go at it but other ideas took over and I never quite got round to it so I’ll just live with it as it is and maybe revisit it later. In the mean time I had to come up with some other plans and while sat in front of the TV one evening I started doodling some ideas. 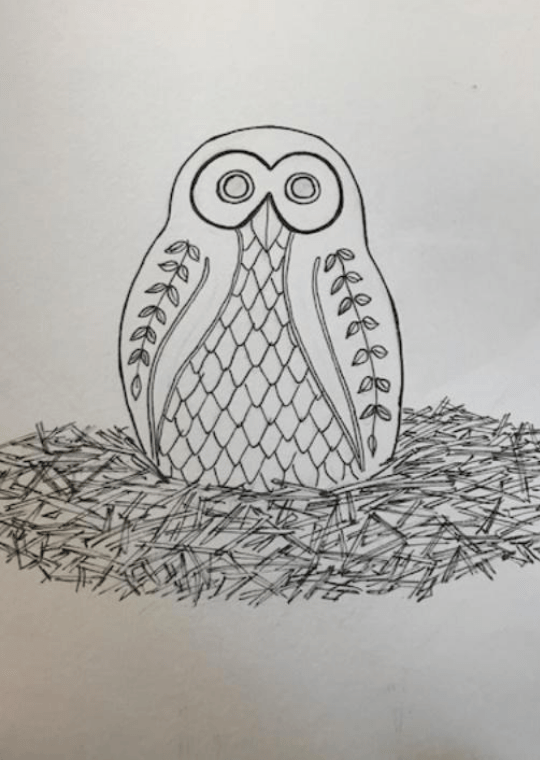 I’m not much good at drawing and my sketches are usually just ways of getting things out of my head and in this instance a funny little nesting owl appeared. I wasn’t overly impressed with it but I happened to have a set of watercolour pens with me so I decided to see if a bit of added colour would improve things. She turned out to be a rather flamboyant lady with rather exotic plumage and she kind of captured my heart. I’ve named her Odette which means home lover. I have a little routine in the morning of making my first coffee and sitting and watching the birds in the garden feed from the filled coconut shells I put out for them. I decided I wanted to capture a lovely little greenfinch that visits each day and the logical move was to move from doodling with pens to doodling with thread. I’m not one of those people who can stitch amazingly realistic critters so I have to do stylised interpretations. I love the work of Matt Sewell who paints beautiful bird illustrations which are accurate in their characteristics but have a lovely playful style. I don’t think my greenfinch is that accurate (especially as females aren’t that green!) but I do love it nonetheless. My next piece was a bit of challenge and somewhat painful in the making. Whilst rummaging for something in the studio I came across a bag of silk worm cocoons (that I’d had forever and never know what to do with) and it occurred to me that they would make great nests for some tiny little creature…but what? Enter Monty the needle felted mouse. 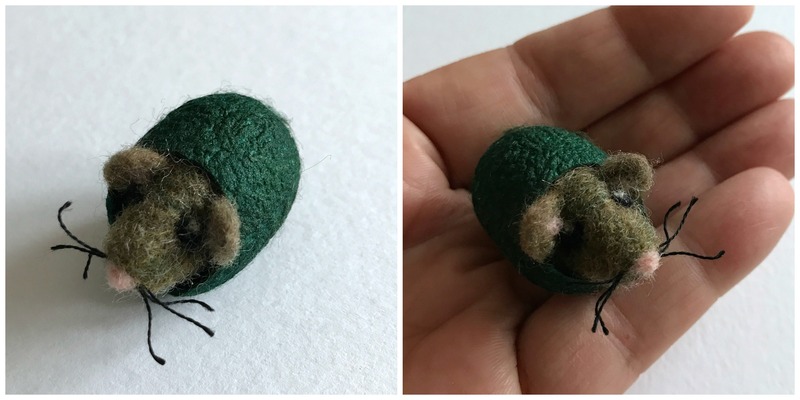 I have never needle felted anything this small…not much more than an inch from nose to tail and I stabbed myself numerous times with the needle. Again, I am completely in awe of artists who make those tiny little felted creatures that look like the real thing and I just can’t do it. But Monty knows he’s a mouse and he’s cosy in his little cocoon nest so that’s all that matters. 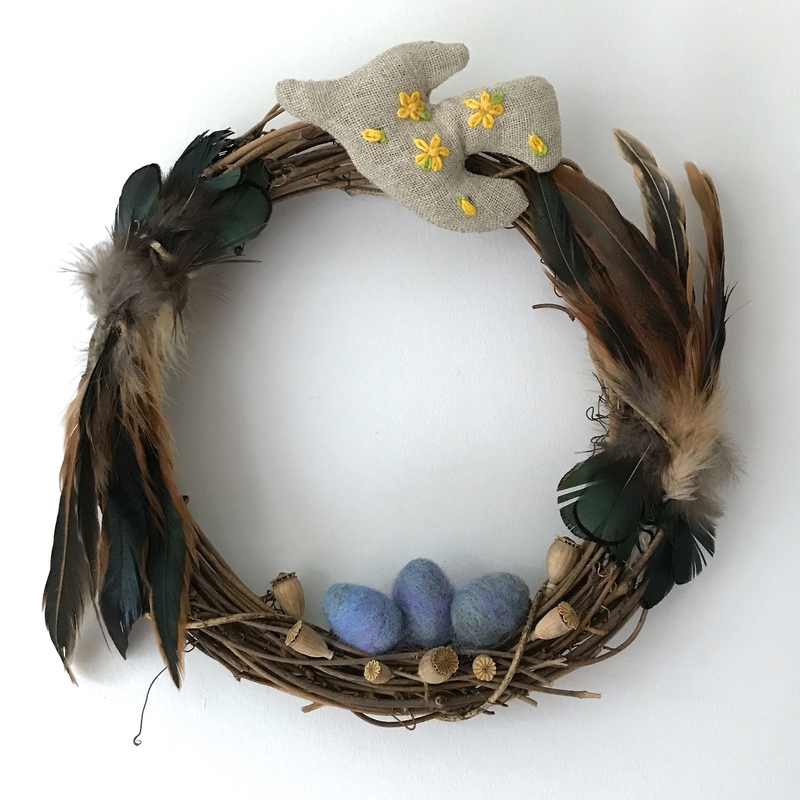 Since this challenge falls over Easter and it is spring (not that you know looking at the quagmire in my garden) my last piece was an attempt to make a nest inspired decoration. However I didn’t quite get this one finished. I went back to my idea of decorating with feathers and this time used a willow wreath as the base. Along with the feathers I made some felt eggs and added some dried seed pods…so far so good. I also made a folk style bird to go on it but I’m not sure whether I like it or not and if not, what to replace it with as it needs something. Anyway, I ran out of time to do anything else which probably means it will be Easter 2019 before it gets finished and displayed – Oh well! Previous Art Elements Component of the Month Reveal – It’s all in the Runes. Next Art Elements Theme Challenge – Horses. Monty and Odette are my favourites 😀 I think your doodling is brilliant! You are a very creative lady! I love wreaths in the home so I am very fond of yours. Your greenfinch is so cute. The nest that you made for it is adorable. I love seeing your needle work. All of your creations are a treat, including the ones that didn’t go according to plan. (which I totally understand). I think the owl sketch is my favorite because of her expression and the colors, but the itty bitty Monty is quite adorable too. Oh my! You did have tons of ideas and inspiration this month. I love them all. You know I love the woven piece-it has a nesty feel to me. I wonder if you bent the wires into a curved shape to create a concave piece if you’d like it more. I love it as is but if you wanted a more nest-like structure you could try it. Odette’s coloring is just gorgeous. I adore Monty-I don’t know how you needle felted something that tiny without puncturing a finger or two! The greenfinch is also beautiful-perfect stitching. I think I like your wreath without the bird, seems a little heavy for the airy feel of it. All in all, eveything is fabulously creative! Thanks for playing along this month. All your pieces are great! The owl colors, the stitching … everything!! I feel almost inadequate, having only created one piece for this challenge :). I love how you name your pieces! Odette and Monty, wonderful! And your beautiful wreath! I am impressed how much you created (and such different ideas and projects!). The mouse made me squee! The wrath is gorgeous (I also prefer it without the bird, maybe some flowers? But I do love it like it is! It looks so elegant while still being a little bit whimsy. And the green finch… I want the green finch! He is wonderful! Your house is going to look like an art gallery soon! Love all of your creations and the new directions you’re taking. The little greenfinch is my favourite though. I didn’t realise you’d designed him yourself… he’s fabulous!!! I love all the nests, but Monty and his cocoon are my favorites! I’m inspired by my own little hoard of silkworm cocoons now! Monty! Wow. He’s a dapper wee fellow. Odette- she has such charming personality. Dressed up but staying home. Adorable. And the green finch? I see your year of stitching last year has setting into your fingers and is now ready and willing whenever you call it up. 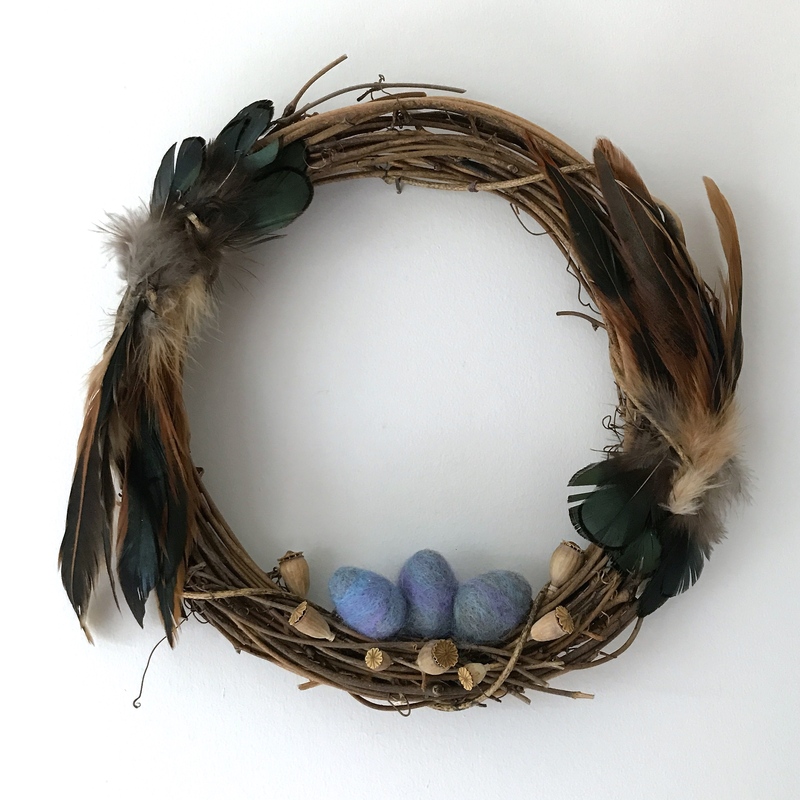 I love the wreath with feathers and pods and eggs. I prefer it without the bird as then the feathers color really takes visual precedence. I have some of those cocoons. Maybe see nesting goddesses? Wow! You were one busy lady for this challenge! I love Odette… what a cutie! And Monty and his little cocoon nest… adorable! 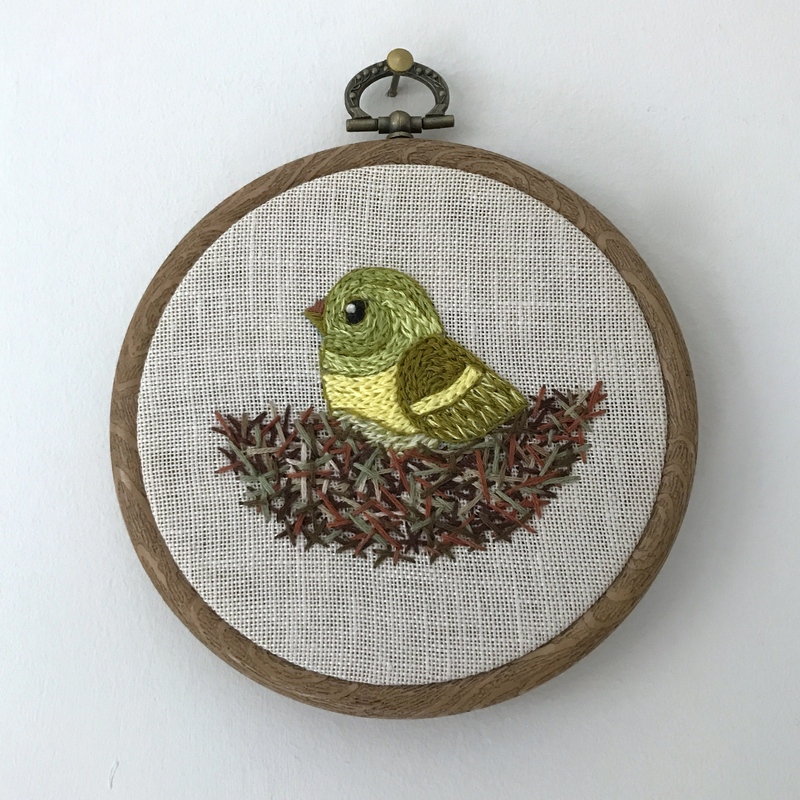 I’m also very fond of your stitched greenfinch. I’m impressed by all the different media you worked with this month. What can I say, I love everything you made – the owl, the finch, the tiny mouse, the circular woven nest and the wreath! This challenge, again, reminded me of neglected projects in other media and how I missed the opportunity to deviate from jewelry making! Wow you were busy! Odette looked lovely as a drawing and then really came to life with the added colour! 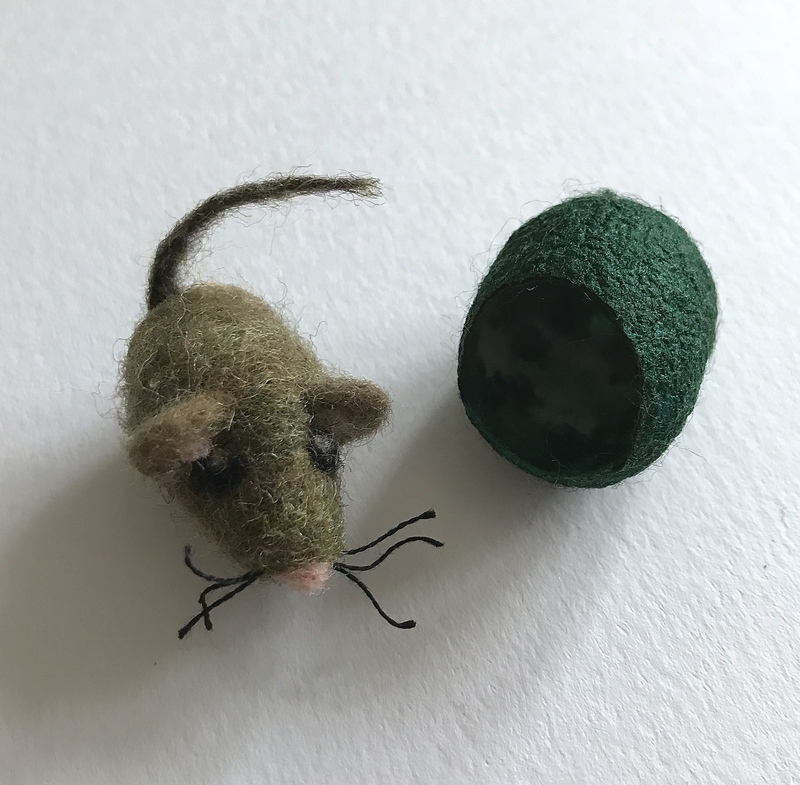 Your little greenfinch is so beautifully neatly stitched and your mouse is so cute and tiny! Wow! You were busy! The woven pieces reminds me of your dorset buttons – and the owl is awesome! So is the bird but the mousy is soo cute!